Aims: Acute pancreatitis (AP) is a common condition. Local complications are associated with the development of pancreatic necrosis. It has been postulated that necrosis is related to a disease-related coagulopathy. This presumed coagulopathy has not been clearly defined. Standard tests of coagulation have proven inadequate in determining the state of coagulation in AP. Thromboelastometry (TE) is a means of assessing whole blood coagulation. TE has proved sensitive in the detection of a range of coagulopathic states, particularly sepsis, but has not previously been used in AP. The aim of this prospective study was to assess coagulation in AP using TE. Methods: 86 patients (serum amylase greater than 300U/L) were recruited within 6 hours of admission. Average age 62 years, male:female ratio 63:37. Venepuncture was performed at 0, 6, 12, 24 and 48 hours from admission. 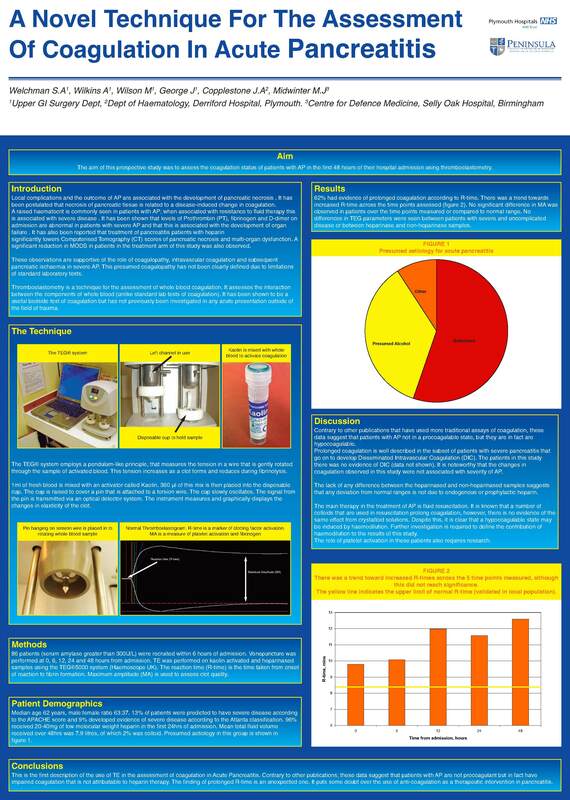 TE was performed on kaolin activated and heparinased samples using the TEG®5000 system (Haemoscope UK). The reaction time (R-time) is the time taken from onset of reaction to fibrin formation. Maximum amplitude (MA) is used to assess clot quality. Results: 13% of patients had APACHE scores predictive of severe disease. 9% developed severe disease according to the Atlanta classification. There was no significant difference in R-time between heparinase and non-heparinase samples. 2.3% of all samples had R-time below normal range while 62% had evidence of prolonged coagulation according to R-time. There was a trend towards increased R-time across the time points assessed, although this did not reach significance. No significant difference in MA was observed in patients over the time points measured or compared to normal range. No differences in TEG parameters were seen between patients with severe and uncomplicated disease. Conclusions: This is the first description of the use of TE in the assessment of coagulation in AP. Contrary to other publications on coagulation in AP that have used standard laboratory assays, these data suggest that patients with AP are not in a procoagulant state but, in fact, have impaired coagulation that is not attributable to heparin therapy. The clinical significance of this is unknown and requires further research.